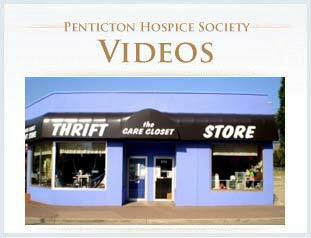 Palliative Care Team | Moog & Friends Hospice House – Penticton Hospice. The Penticton & District Hospice Palliative Care Program is a “program” of care rather than a “place” of care. The “care” offered is geared toward patient comfort when cure or active treatment of the disease is not an option. The goal is that both the patient and family members are supported through this time of illness, death and bereavement according to their needs and wishes. Assistance may be provided by a variety of team members and may occur at home, in hospital or in Moog & Friends Hospice House. We offer skilled and compassionate medical care, together with social, emotional and spiritual support from professional and volunteer caregivers. We focus on your care and comfort, rather than a cure. This means that we work to control symptoms that may interfere with your daily living rather than trying to cure your disease. In all of this, we will maintain respect for your right to be a person, rather than just “a client” or “a family”. You, your family and your other caregivers have access to a number of services. These services are there to support you and help you deal with a variety of concerns that may arise. As the client, you are the focus of care. You can expect to receive skilled, consistent and co-ordinate care that respects your individual needs and wishes related to all aspects of your life: physical, emotional, spiritual and social. You will decide how involved you want to be in planning and providing for your care. Early planning gives you time to look at all the options and make the best decisions possible. This means you need to be honest and let others know what you want and need, both now and in the future. When it is hard to sort out exactly what you need, other “team members” can help you with this. When you get into any kind of difficulty, you need to ask for help immediately. Little problems are much easier to solve than big ones. The term “family” is used broadly here and includes relatives, friends and other people closely involved with the client. Those people that you view as your family are included as part of your care team. Family members will receive support services directed toward their particular needs. This means it is important for family to let us know what they want and need during this time. Family may also be included in discussions related to the client’s care, such as symptom management, estate and funeral planning and future care options. The primary caregiver role is both physically and emotionally demanding. It is important that your main caregiver consider accepting some help with care from other family members and team members. Getting adequate rest and breaks will prevent caregiver sickness and exhaustion that could prevent the caregiver from being able to look after you or them. Your family doctor is the primary medical person involved in your care at home and is the first person you call with any medical concerns. He or she may visit you at home, refer you to other community caregivers for help with your care and be available for family support and information. Your Home Care Nurse (HCN) will co-ordinate care in your home. (S)he may give nursing care, teach client care and health, request other services (such as Social Work, Hospice Volunteer or Community Health Worker), arrange supplies and home aids, and provide emotional support to you and your family. In discussion with your nurse, a determination will be made about the frequency and need for nursing visits. This person has been trained to help you with personal care needs in your home, or respite for family members. Some Community Health Workers have also received extra training in caring for palliative care clients. Community Health Workers can provide care any time of the day and any day of the week. It is important that you think about what help you need and discuss this with your Home Care Nurse or Case Manager. As a general rule, Community Health Workers can companion, assist with meals, help with bathing and dressing, spend the night, and give family members a rest. There are also some nursing tasks that CHWs can do with the approval and supervision of your Home Care Nurse. Some tasks include assisting with medications, or applying ointment. Home Support Workers cannot do laundry or housekeeping duties, prepare meals, look after pets or other family members, provide transportation, or attend to business matters. You may have more than one CHW, depending on the amount of care you require. Your Home Care Nurse will set up a plan for the CHW to follow and will make changes to the plan, with your input, as necessary. A limited amount of help related to your needs is provided free of charge to a maximum of 360 hours. This is a physician who works with the Penticton & District Hospice Palliative Care Program. This physician’s job is to oversee the medical care of registered clients and to act as consultant for your family physician. The goal is to develop a plan of action that will ensure you have the most comfort possible throughout your illness. This is a nurse who acts as a coordinator, consultant and educator for hospital and community care programs. This nurse works with the hospice palliative care team members to provide support for your care and provide a link between hospital and community care. The coordinator can offer advice and up-to-date information on a wide range of nursing interventions, procedures, options and issues related to your care. A clinical pharmacist on the Palliative Care Team is available to discuss your medications with you and your family. The pharmacist can provide pamphlets and guidelines to assist you in understanding and managing your medications. (S)he may assist you by making up a medication calendar to help you keep track of your medications. The pharmacist is able to communicate with your physician, your nurse and your community pharmacy to obtain the best medication control for your symptoms. Practical matters such as: planning options of care (locations, respite, community resources), communicating within the care team, planning a representation agreement, estate planning (wills, probate, finances), preparation for death (funeral arrangements, place of death). Family issues such as: dealing with challenges of care, addressing family problems, resolving unfinished business, and exploring family beliefs and rituals. 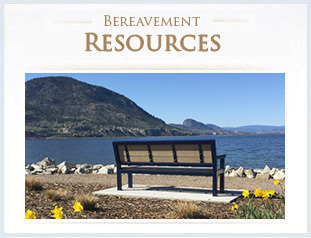 Grief issues such as: dealing with the losses and changes that happen during illness, understanding and working through the emotions of grief, conducting life reviews, and planning for spiritual support. Education such as: learning to practice self-care, managing stress, use of relaxation techniques, reviewing tasks of care giving, and exploring community resources. Hospice volunteers are an important part of the Penticton & District Hospice Palliative Care Team. They are caring people from all walks of life, who bring many special talents and skills to their work. Some have had experiences similar to your own, which may give them greater understanding of your particular situation. All of them are specially trained for the tasks and roles they assume. If you are a member of a religious or spiritual group, you may decide to ask the pastor or members of the congregation to visit you at home or in Hospice House. If you do not already have any particular affiliation, it is still possible to arrange support. You can contact the group of your choice directly or ask your nurse to help you locate an appropriate person. When in Hospice House, you can also ask your nurse to have the Chaplain visit you. A physiotherapist and occupational therapist can provide therapy services to you in hospital, your home or residential care facility. Services provided include help to maintain independence and energy conservation, pain management therapies, stress management, assistance with walking and transfers, recommendations for special aids and equipment and adaptations to your living environment. You, your doctor, family member or other health professional can make a referral by contacting your nurse. Education is available for both you and your caregivers as needed. Nutrition counseling may include suggestions for incorporating nutrient dense foods (including the use of supplements), meal preparation, or ways to cope with symptoms of nausea, vomiting and constipation. The community nutritionist may also be involved in your care at home. 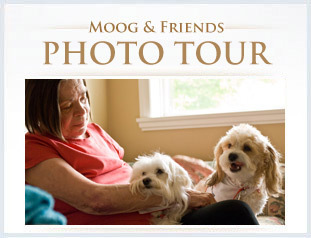 The Moog & Friends Hospice House nurses have special education and practice in many aspects of palliative care, including pain and symptom management, communication skills, death and dying. They will support you and your family during the time you are on the unit. They will focus on your comfort and pay attention to your unique needs and what is important to you at this time in your life. You and your family can discuss your thoughts, concerns or difficulties with your nurse. How well we all work together is crucial to the quality of your care.